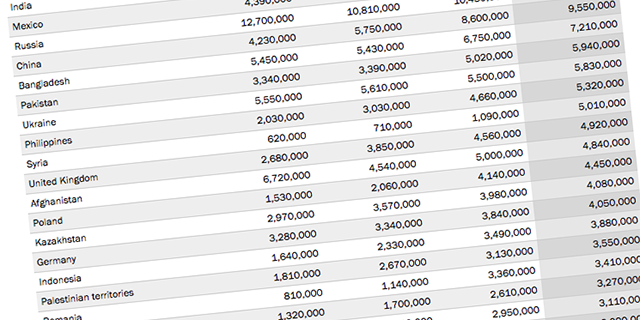 View our newly updated interactive tables to see the numbers and percentages of migrants worldwide by country. Some 244 million people worldwide – many seeking improved economic opportunities or fleeing physical danger – have emigrated from their countries of birth and currently live in other countries, according to 2015 data from the United Nations. That’s a relatively small share of the global population (about 3%), but the impact of out-migration has been uneven worldwide. In nine countries, 20% or more of the people born there now live in a different country. For a sense of scale, if one in every five Americans were to emigrate abroad, this would be roughly equivalent to departure of 64 million people, or the current total combined populations of California and Texas. For some of these nine countries, the bulk of emigrants left their birth countries a couple of decades ago (for example, many of those born in Bosnia-Herzegovina left during the early 1990s). Meanwhile, for other countries, most emigrants have moved more recently (for example, among those born in Syria, most have left since 2011 when the Syrian conflict began). For these nine countries, the destinations of emigrants can sometimes be quite focused. For example, in the case of Kazakhstan, 63% of its emigrants live in neighboring Russia in 2015, while 83% of Jamaica emigrants reside in either the United States or United Kingdom. Some emigrant populations have settled indefinitely in their new home countries, while for others, their migrant status is less permanent. For example, the majority of Portuguese emigrants are living permanently in places such as the U.S. and Brazil. Meanwhile, the majority of Syrian emigrants living in Turkey, Lebanon and Jordan would mostly likely be expected to return to Syria when conflict ceases. Emigration can have significant demographic impacts on nations. For example, many young adults have left Albania, while emigration is more common among more highly educated groups in Trinidad and Tobago. In some instances, out-migration among particular groups can exacerbate population aging and leave significant skill gaps within these source countries. Syria is only one of the nine countries with a fifth or more of its native population now living abroad and is one of the world’s leading countries in terms of the absolute number of emigrants. Otherwise, the largest emigrant populations in the world often originate in countries with relatively large total populations. For example, India (15.6 million emigrants), Mexico (12.3 million), Russia (10.6 million), China (9.6 million) and Bangladesh (7.2 million) have the largest numbers of people not living in their birth countries. Because these countries also have large populations, however, the shares of their populations that emigrated are not as high as for the nine nations where 20% or more have left, even with relatively high numbers having left. For example, only about 1% of Indian- and Chinese-born people live outside of India and China in 2015. Larger shares of those born in Mexico (9%) and Russia (7%) live in different countries; but, even with their millions of emigrants, the emigrant percentages of these countries’ birth populations remain far below many other nations. Although far from rivaling the nine nations discussed here, some countries traditionally thought of as emigrant destinations have also experienced their own outflow of native-born populations. For example, about 8% (or nearly 5 million people) of those born in the United Kingdom live outside of the UK. Similarly, about 6% (or about 4 million) of German-born people live outside of Germany. By contrast, a much smaller share of U.S.-born people have left the United States: Only 1% of those born there (or about 3 million people) live in other countries, even though about a fifth of the world’s migrants live in the U.S.